Saelig Company has introduced the AIM-TTi TGF4000 Series of high quality, dual-channel arbitrary waveform generators, with models to 240MHz providing particularly low harmonic distortion and phase noise. One important parameter that the series works well in is audio band total harmonic distortion at just 0.05%. The device’s pulse generator design offers an excellent pulse width resolution of 100ps over a period range from 10ns to 1000s. The pulse edge speed is also separately variable from 3ns to 800s. Pulse jitter is noticeably lower than similar generators at only 30ps. Each of the two channels can be run independently as two separate generators. Coupled operation is provided for amplitude, frequency, and output on/off, which allows simultaneous output variations on both channels. Relative phase can be set from -360-degrees to +360-degrees with 0.001-degree resolution. The signal generators can provide up to 20V pk-pk signals (10V pk-pk into 50Ohms) for frequencies up to 80MHz. High levels of DC offset can be set together with low signal levels, and the attenuator can be fixed to stop glitches when adjusting levels. Amplitudes can be entered as peak to peak voltage plus offset or as high level and low-level values. The amplitudes are displayed relative to a 50Ohm load impedance or as the open circuit EMF values. Alternately, the user can enter any load value between 1Ohhm to 10kOhm, and the amplitude will be calculated accordingly. 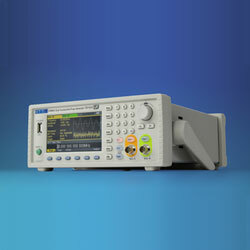 A broad mixture of waveforms can be generated between 1uHz and 240MHz with high resolution and accuracy. Sine waves are produced with low distortion up to 240MHz. Square waves with fast rise and fall times can be generated at up to 100MHz. Linear ramp waves are produced to 5MHz. Ramp and square waves can also have variable symmetry. The device can generate high resolution, low jitter, variable edge time pulses to 100MHz with variable period, pulse width and amplitude.